Registration is over 850, with attendees from 27 countries. The porphyry copper session on Wednesday afternoon was standing room only. Bill Dickinson and colleagues at the Icebreaker. Geologist and murder-mystery author Susan Miller signs books at the AZGS booth. Audience glued to animated porphyry copper model. AGS president Ann Pattison staffing the booth. The symposium is in honor of William (Bill) Dickinson, professor of geology at University of Arizona and tectonicist extraordinaire. Attendees are coming from around the world, including many mineral explorationists and academics. I plan on blogging about the symposium, geologic talks, and mining news in the coming days. Two new reports are out on the proposed Rosemont copper mine in the Santa Rita Mountains, south of Tucson. According to a story in the Green Valley News, the Pima County Flood Control District commissioned a report by hydrologist Tom Myers that concluded that depending on depth to pre-mine water levels, the pit would lower the regional water table by as much as 1,500 feet, and would intercept about 650 acre feet per year of flow to Davidson Canyon. A number of uncertainties in estimating ground water impacts were also outlined. Last week, the AZGS' State Mapping Advisory Committee made detailed geologic mapping of the Rosemont area the top priority for Survey mapping for the state-federal Statemap cooperative program. The committee believes the map can be used to provide more realistic geologic controls on aquifer modeling in the area among other uses. A second report was released by the Marana-based Western Economic Analysis Center. The Rosemont project is projected to create 500 jobs averaging $20-25 per hour, and put $256 million annually into the Pima County economy for the next 19 years. Overall, the mine would produce 2,950 jobs and $488 million annually in Arizona, and $2.3 billion to the national economy, with $43 billion directly and indirectly. Pima County officials are reported as saying the loss in tourism and diminishing of the areas appeal would be greater than those benefits. Last week, Arizona Republic columnist Laurie Roberts became an advocate for more funding for closing abandoned mines in Arizona. Her solution? Stop funding scientific research projects such as “Enhancing Teaching Effectiveness in Undergraduate Geology Education Through the Use of Pen-Tablet Computers” and “A Resource for Assembling the Timescale of Life.”Science has long been an easy target for public figures who are looking to grandstand. Most people won’t understand what the project is about, let alone what the relevance to society may be. Generally, scientists are ineffective public communicators, so there is little risk in going after us. We certainly could divert all of the state’s scientific research funding of $35 million to closing abandoned mines. No doubt there are many other state programs that someone would be happy to shut down as well. But there may be more responsible and effective solutions for fixing the abandoned mine problem. 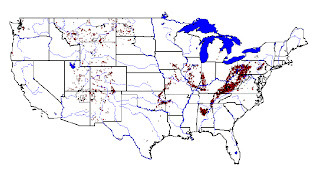 The U.S. General Accounting Office in 1996 reported (http://www.gao.gov/archive/1996/rc96030.pdf) that there is no comprehensive inventory of abandoned mines on federal lands, nor private and state lands. They reference a 1991 study that estimated a cost of $11 billion to reclaim existing abandoned mine lands but didn’t lay out the details of how they came to that figure. Right now, over $1.8 billion sits in the federal government’s Abandoned Mine Lands fund in the Office of Surface Mining (as reported in 7-06, the latest figure posted). Unfortunately, the money is dedicated to reclaiming coal mines, not hard rock mining sites such as predominate in Arizona. Since 1977, the U.S. has collected over $7.4 billion from coal company production, and spent $5. 4 billion, leaving 24% of the money socked away in the treasury. The feds are using the funds as an accounting technique to help balance the budget, so they are reluctant to spend the money on the purpose it was collected. Another problem is that the coal-producing states fight to make sure the monies are used only for reclaiming abandoned coal properties or go to coal-producing states, and not to hard rock mines or states. Thus, we have a situation like Wyoming that produces a large part of the nation’s coal, getting a comparable return of the abandoned mine fees. However, all the abandoned mines in that state have been reclaimed, leaving the cash flow to be used for such things as new buildings on the University of Wyoming campus and a variety of other projects that can be justified as mining-related. Opening up the federal abandoned mine lands fund to fixing all types of mines is an obvious solution. However, such an effort will create a political firestorm, as it has when it's been suggested in the past. Coal companies can raise a valid point as to why they should be taxed to pay for problems in another industry. But to the parents of a child that died from falling into an open mine shaft, does it make a difference whether the mine produced coal or gold? 100,000 abandoned mines in Arizona? 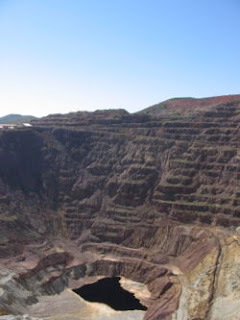 The State Mine Inspector's office has inventoried over 10,000 abandoned mines in Arizona since 1992 but estimates there may be as many as 100,000 across the state (http://www.asmi.state.az.us/faq.asp). About 13% of the known mines are considered a significant public safety hazard. Extrapolating, that could mean as many as 13,000 dangerous shafts or pits, most of them unmapped or unknown. Like the one near Chloride where two young girls on ATVs fell in over the weekend, killing one of them. Arizona is lucky if it fences or seals off a dozen abandoned mines a year. The abandoned mine program is small and costs are high to block off the most dangerous locations. State Mine Inspector Joe Hart, a former state senator, armtwisted the Arizona Legislature into adding $50,000 to his agency's budget this year for abandoned mines. Phelps-Dodge, now Freeport McMoran, contributed a matching $50,000.